In the early Ptolemaic period, how were mouths often rendered on figures? During the early Ptolemaic period, the foreign kings continued to build temples consistent with Egyptian structural traditions instead of Hellenistic forms. During the Ptolemaic period, rules governed the type of attributes of offerings. What were the objects that could be offered to male deities, and what could only be offered to female deities? At Edfu, the main cult center of the god ___________________, a living falcon was chosen was the reincarnation and was the main statue of decoration. This bull reincarnation increased in popularity during the Late and Ptolemaic Periods. Who does it represent, how is its divinity signified, and what are traditional markings on this type of statue? In the fourth century, burial chapels often had relief decoration in the lintel area above the doorways. What were the three themes that were most prominent? In figure representation through Ancient Egypt, the leg striding forward is always the ‘back’ leg, or leg furthest from the viewer. The tomb of high priest Thoth Petosiris contains scenes were Egyptian and Hellenistic scenes were merged. Where were these scenes located within the temples and why? Statues of the goddess Nephthys were often placed in burials. 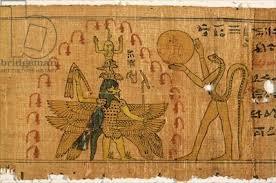 However, in the Late and Ptolemaic period this figure changed how? On the grid systems, gods would hold their sceptres seven squares in front of their center axis, and goddesses would hold their papyrus scepters only six squares in front. What was the reason for this? Horus stelae, with images of young Horus standing on crocodiles and grasping snakes and other dangerous animals in his grasp, became increasingly common in the Ptolemaic period. What was their function? Statues of men during this period can be divided between those that are idealizing and those that are realistic. The realistic ones, likely derived from Hellenistic traditions, were identified how? What happened to the temples of Philae at Aswan in the 1960s? Sometimes during the Ptolemic period, royal cartouches were sometimes left blank in periods of disorder. According to our text, what was the reasoning behind this? Well-preserved wooden stelae from this period have a ba, or the spirit of the deceased, in the form of a _____________________ placed on top.